A 144-acre forest in Erie County's Wayne Township has been donated to the Foundation for Sustainable Forests to be conserved in perpetuity as a sustainable working woodland. Under the stewardship of the FSF, the land will remain a part of the local community by staying on the tax rolls, providing jobs through active forest management, and providing an educational setting for schools and other groups. The property, to be known as the "Ewing Family Woods," was donated by Millcreek Twp. resident Dr. Jane Ewing Woods. She acquired the property in 1990 from her father, Orlo Ewing, who purchased this parcel in 1949. The property has been integral to three generations of the Ewings for 70 years of cherished family gatherings, horseback riding, hiking and exploring, winter sports, tree planting, and sharing with friends. As the owner of the woodland, Dr. Ewing adamantly viewed herself as a "temporary guardian" of the land. "It really belongs to God. It's my privilege to be charged with its protection and conservation for the future," she said. Even before she assumed ownership of the property, Dr. Woods attended seminars and field workshops to learn more about forest stewardship. This included touring her woods with foresters for further perspective and education. In 2000, she began consulting with Troy Firth, founder of the Foundation for Sustainable Forests, to help manage her woods. Mr. Firth consistently applied his "worst-first" approach to tree selection for harvest, a conservation-minded technique that seeks to improve the condition of the forest. He also began managing understory vegetation to control the spread of invasive species and to cultivate regeneration and seedling diversity. On her decision to donate the property to the Foundation, Dr. Woods stated: "My time here began before rural properties were being subdivided and their farming fields and woods so fragmented. But I've also had enough years now in working with Troy Firth and the FSF to see their astute observations and forest management work with nature to benefit and protect the whole ecosystem." 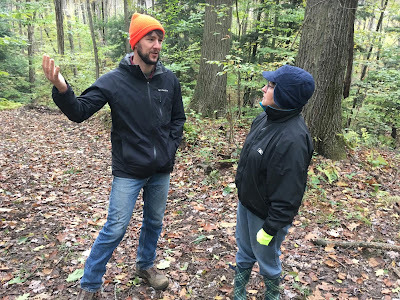 Based in Spartansburg, Crawford County, the Foundation for Sustainable Forests is a nonprofit land trust working throughout northwestern Pennsylvania, western New York and northeastern Ohio. This donation supports its mission to protect forested lands, promote healthy ecosystems, support rural communities through working forests, and highlight sustainable forestry practices in the region.